The figures presented here were selected to illustrate aspects of xylem, especially the conducting cells: tracheids and vessel elements. 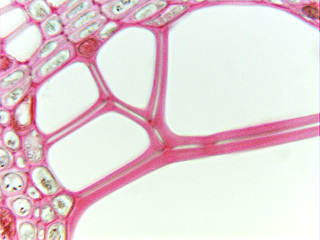 The legends were written to complement the more complete discussion of xylem presented in Chapter 7 (pages 109 to 128) in the textbook Plant Anatomy by J. D. Mauseth, published by Cummings & Hathaway. Water-conducting vessels in the stem of a grape vine (Vitis).